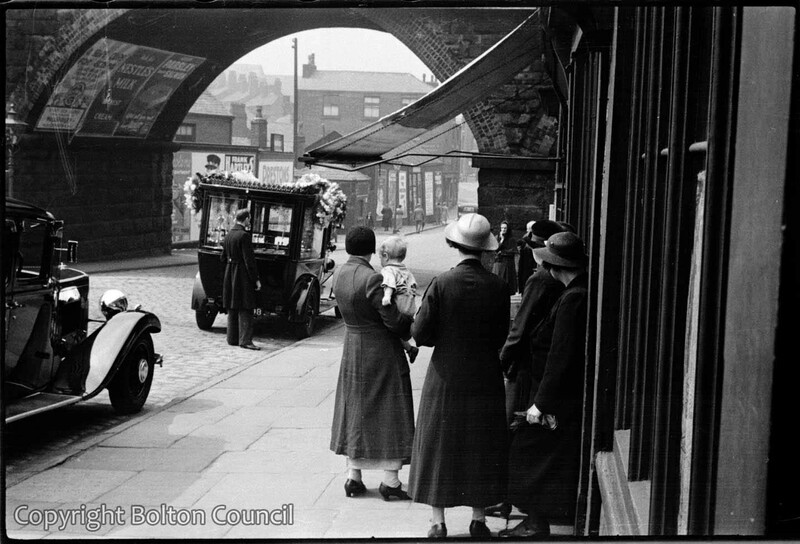 Previously this was identified as Folds Road but several commenters have pointed out that the view is through the viaduct that crosses Bury New Road facing towards Canal Wharf. There is a photograph in the comments for the next image in this series that shows the same area but taken from slightly further back. It does also look to me like the train viaduct at the bend on Folds Road near where is now Turner Bridge Road? My auntie lived near that bend! This is at the bottom of Bury Road,as stated in the caption. The shops where the spectators are standing are Cranes paddlers and next door(?) an off- license. Further up the brew ,on the left ,is the Parish church.We used to walk under the viaduct on our way to church and Sunday school when Cannon Norburn was the vicar. Is this near where 43a would have been? My Grandma used to live there in early 1900’s. she was a music teacher at a school, I think maybe St Johns but need to check that. Her name was Beatrice Allanson, she married John Booth the headmaster in 1917. I looked for the house for first time last weekend and found it all demolished. ( I don’t live in the area). This sequence of photographs was definitely taken from Bury New Road. Church Wharf can be seen through the railway arch. In the row of shops, to the right, one belonged to Greenhalgh’s plumbing business. I seem to remember the business was run by two brothers, one of whom (Alan) served in WW2 and was taken prisoner by the Japanese. He returned and worked for Cubitt’s in London. We spent holidays with him, his wife Jessie and son Keith (1948-51). I lived at 1 Bury Old Road (behind the photographer) 1937-46.